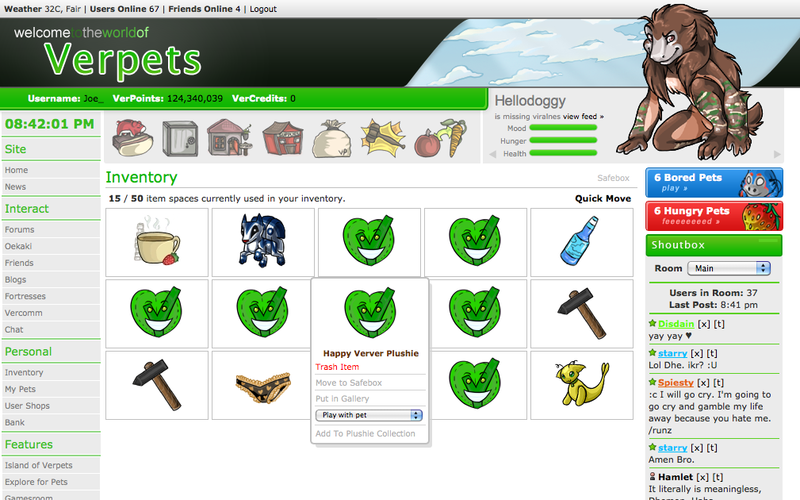 Verpets is a Virtual Pet Site with about 58,347 users. Here at Verpets we try as hard as we can to create a safe, fun, and exciting community where all sorts of people come to take care of a virtual pet, battle, make friends, play games and interact with the world of Verpets. Whether you want to chat with friends or be the best of the best - Verpets is the place for you! Grab a Buddy's Pet and Play in the Park! Eat with a Friend's Pet at Buck's Food Court! Play the Newly Revamped Scratchcard Game! Amazing Weapons in the Cash Shop! 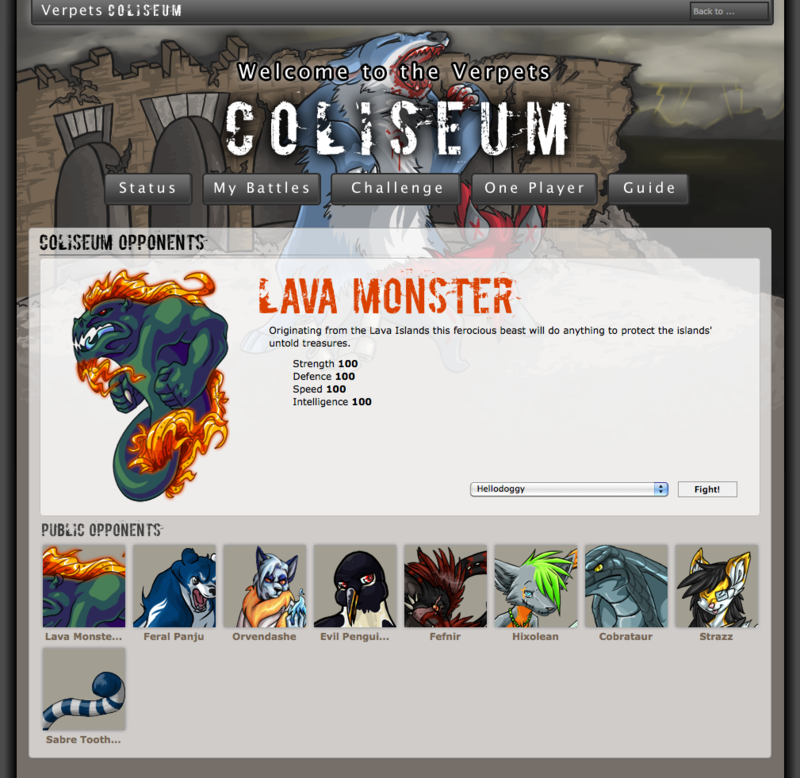 The Verpets Coliseum is one of the most sophisticated of any Virtual Pet Site. You can challenge up to four fellow users to a battle with a wager at stake or alternatively challenge one of the automatic AI opponents which vary by difficulty and cater to battles from novices to experiences pros. As you battle with your pets they gain experience and work their way up the Coliseum ranks from a pansy to, one day, a warlord! 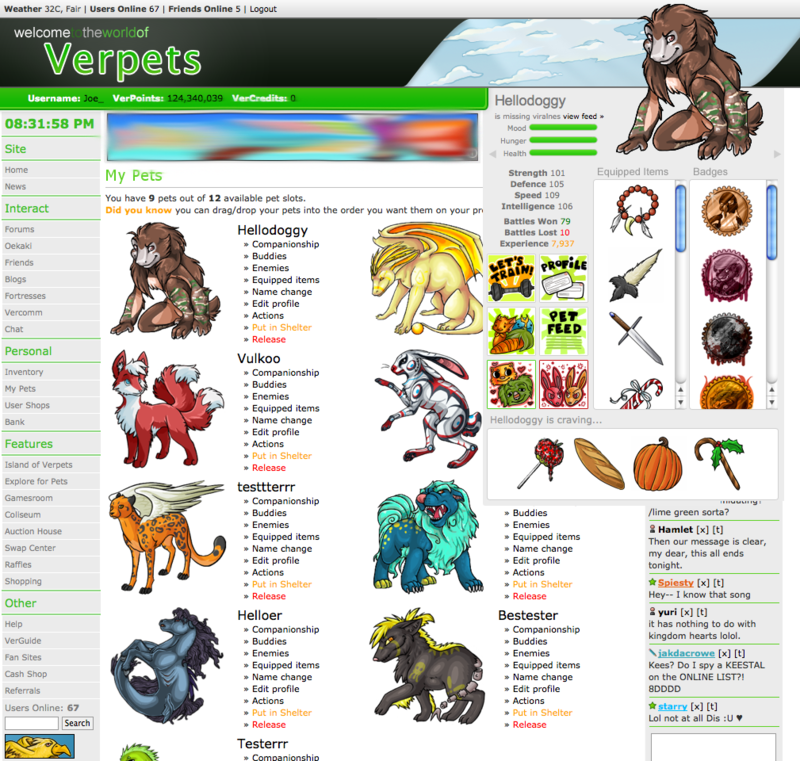 As a Virtual Pet Site, we like to keep the pets at the center of the Verpets feature set. That's why on every page you browse your pets follow you in the top right hand corner of the screen - place your mouse over them and you can instantly access information about their status, awards and cravings. From your 'My Pets' page you can manage countless pet oriented features including enemies, buddies and companionship between other pets on the site. Pets can also write blog entries, comment on other pet profiles, battle in the Coliseum and loads more! There are over 30 pet species on Verpets, as well as numerous special forms such as death and divine. Some pets you must 'explore' and battle to obtain, others are limited edition or require extra work to make yours. 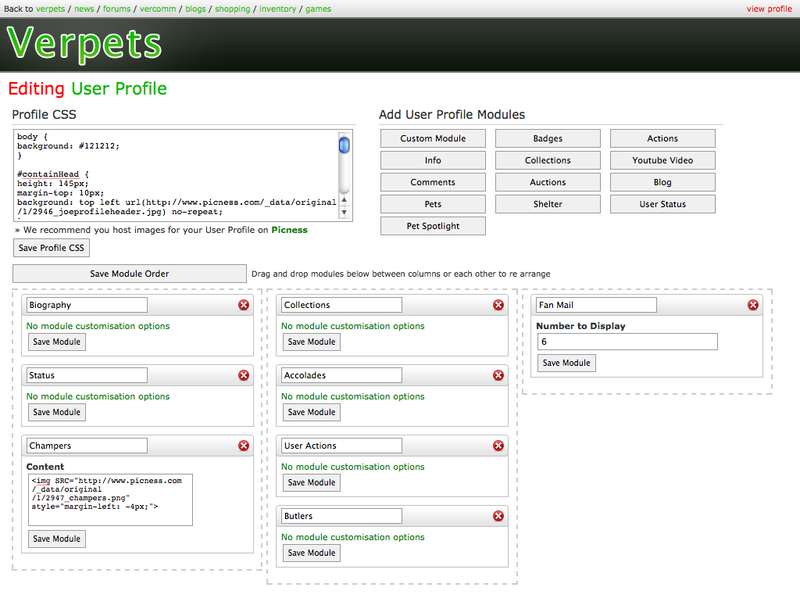 On Verpets you can fully customise both your own and each of your pets own profiles! Drag and drop modules to create basic, column based designs. Know some CSS? Spruce up your profiles with your own completely customised style sheets! Using pet profiles you can create characters out of your pets - great for role playing - and allocate 'functions' to their profiles which allow interaction between your pets and other users pets such as pet poking or greeting. We're constantly releasing new items for you to collect on Verpets and as well as adding them to your collections (found in the Games Room), you'll find yourself wanting to unlock their various commands and organise them in your Safebox and Inventory. On Verpets we've made managing your items in these areas simpler than on any other Virtual Pet Site. An intuitive interface with search and categorisation functions makes sorting and finding items a dream and using them exciting and without hassle. On Verpets, pets are more than just account accessories - you can make your pets interact with others, post statuses and share what is happening with your pets with friends, enemies and companions!